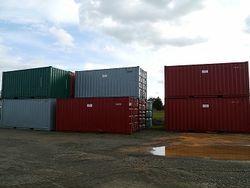 Auzbilt maintains a modern, secure fleet of hire shipping containers, suitable for all types of storage including furniture, document storage, machinery, plant & tools, in a range of sizes from 3 metre, 6 metre & 12 metre in length. Our skilled staff can also modify & fit out containers to your requirements and are suitable for workshops, tool stores, animal shelters etc. New or used containers are readily available to purchase, with the option of crane truck, side loader or tilt tray delivery.